30-year-old Polish mountaineer Andrzej Bargiel became the first person to ever successfully ski down K2, the second highest peak in the world, in July. K2 is considered one of the toughest mountains to climb in the world. Bargiel attempted the feat last year but was turned back by bad weather and poor snow conditions. Polish mountaineer Andrzej Bargiel became the first person to ever successfully ski down K2, the second highest peak in the world, in July. Located in the Karakoram mountains in Pakistan, K2 is widely considered to be one of the most difficult and deadly mountains in the world to climb. At only 30 years old, Bargiel completed one of the last remaining milestones on the mountain by linking snowy section after snowy section in a fluid ski descent of the peak. To accomplish the feat, Bargiel and his team – which included two of his brothers and a group of expert climbers from Poland and Nepal – spent an entire month on the mountain, meticulously planning the descent. Bargiel attempted to ski down K2 last year but was thwarted by bad weather and high avalanche risk. “I’m very happy it turned out well, because I’m here for the second time, and I’m glad I don’t have to come back,” Bargiel told CNN via satellite phone when he returned to the safety of base camp. The feat is being heralded throughout the mountaineering world as one the premier first descents (the term for an instance when someone skis down a peak for the first time) ever completed. This year, luck was on Bargiel’s side. At around 4 a.m., he climbed alone with his skis from a high camp on K2’s flank to the mountain’s summit. Bargiel reached the summit around 11:30 a.m., according to Red Bull (the energy drink company sponsored the trip). He did not bring oxygen, which some climbers use to help them breathe at high altitudes. Once he reached the summit, Bargiel clipped into his skis and began the long descent. At Camp IV – around 8,000 meters or 26,200 feet above sea level – he was forced to wait for an hour for bad weather to clear up. Bargiel made it to K2’s base camp right before dinner, at around 7:30 p.m. In total, the 3,600-meter or 11,800-foot descent took him just over eight hours. At 8,611 meters, or 28,251 feet tall, K2 is the second highest mountain in the world, just below Everest. Only 417 people have successfully climbed K2 since it was first summited by an Italian team in 1954. That’s a stark difference from Everest, which is higher but technically easier to climb. About 5,000 people are estimated to have attempted to climb Everest since the 1950s, and its growing popularity has made treks there feel like conveyor belts of hikers, according to some accounts. 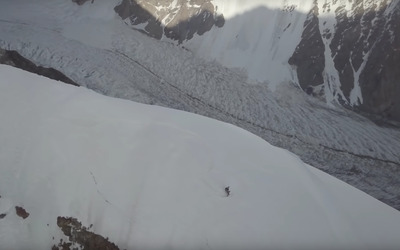 People have tried to ski down K2 before, but those attempts ended in tragedies. Fredrik Ericsson, the last person before Bargiel who attempted to ski down from the peak, fell to his death in 2010. The year before that, Michele Fait, a 44-year-old Italian mountaineer, crashed and died during an attempted ski descent. Bargiel’s solo summit push and epic descent were filmed by his younger brother, who sent an aerial drone from mountain’s base camp, equipped with an array of cameras. The drone also came in handy as a rescue device: through the cameras, the younger Bargiel spotted a Scottish climber who was presumed dead and helped guide rescuers to the climber.